When you think of shopping in Brighton, most people will tell you to visit the Laines. This alternative shopping destination is full of independent boutiques and vintage shops. It's great for finding one off pieces if you have the time to rummage. However, Brighton's main high street shopping complex, Churchill Square is a fantastic place to browse all the latest trends under one roof. My one niggle with vintage shopping is the sizing. I often struggle to find vintage clothes that fit, as body shapes have changed with the fashions and I find that most pieces are either teeny tiny or on the larger side. The great thing about high street shops is that they carry clothes that are heavily inspired by the past and yet fit you perfectly. Churchill Square is home to a wide selection of stores that do just that. As my degree progressed, I found that I had less and less time to shop and my shopping habits changed. I went from leisurely browsing in places such as Snoopers Paradise and Dirty Harrys and turned to Miss Selfridge, Warehouse and H&M. I found that vintage style pieces were widely accessible in Churchill Square and I could pop in for an hour or two and return home with bags a-plenty ready to continue with my dissertation or revision! I recently popped down to Brighton to explore the Autumn/Winter trends available at Churchill Square. The first is an extension of the Spring/Summer infatuation for animal prints. Zara especially has excelled with cute tops and blouses and are often embellished with studs. 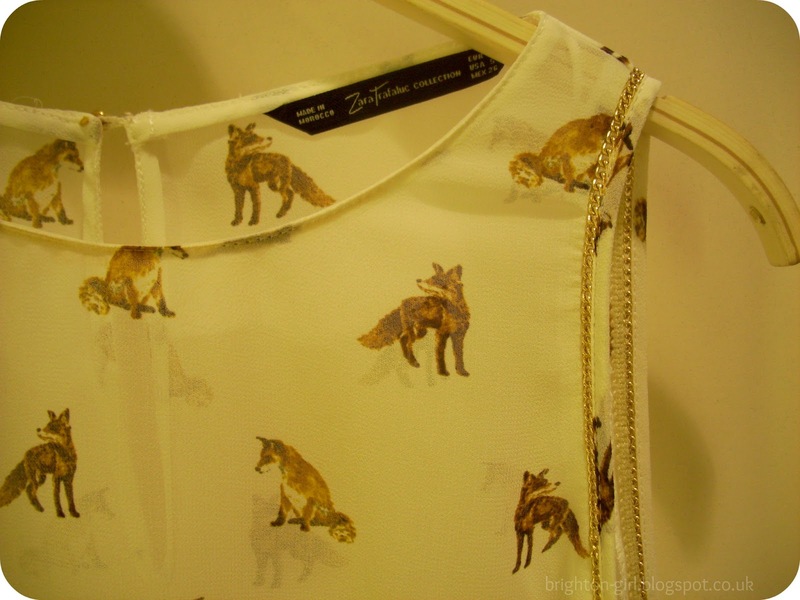 This fox top in particular caught my eye and is toughened up with simple chain detailing and would work really well with coloured jeans and a tweed blazer. Miss Selfridge have lots of knitwear with animal motifs. The leopard jumper was my favourite and would be perfect for snuggling up with a hot chocolate when it turns colder. I teamed it with a pair of cut-off shorts that seem to be a Brighton wardrobe staple! My favourite trend this season is heavily influenced by The Great Gatsby and 1920s glamour. I was interested in how this could be translated into a more casual outfit and so teamed a grey t-shirt with silver peter pan collar with a pair of leather look jeans from River Island. I love how this look can be dressed down with a pair of converse and boyfriend shirt, or dressed up with killer heels and lots of sparkly bracelets and hair accessories. Of course this trend lends itself fantastically to more formal outfits; which results in looks that are fabulously feminine and glamorous but are also sophisticated and oozing opulence. Textures are a key feature of this trend, with lace once again being a popular choice. Studs, pleats, feathers and pearls also play a big part and look fantastic when combined together. 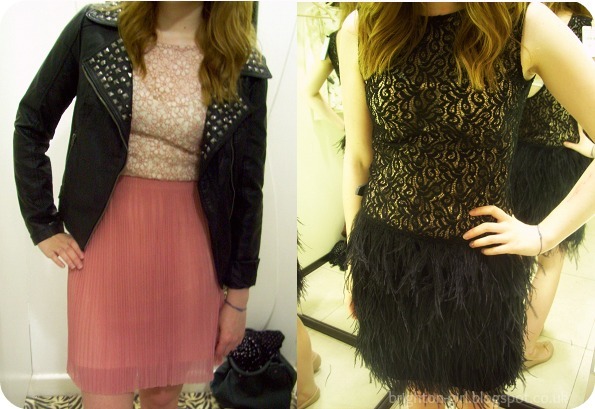 Miss Selfridge have a pretty pink dress that looks superb when teamed with a studded leather jacket and included in River Island's Chelsea Girl collection is a great black lace dip hem dress. However, once again Zara has come up trumps. The adorable lace and feather dress was a dream to try on. It was just the right length and would be perfect for a Gatsby inspired cocktail party! 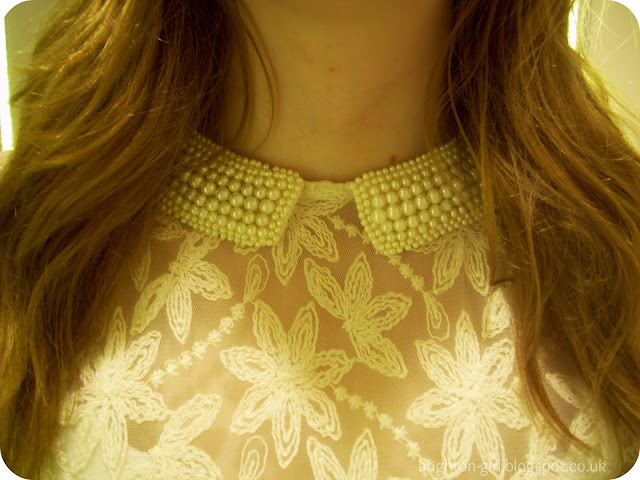 I also really loved their brocade pattern trousers and a cream lace blouse that featured a sweet pearl collar. The Autumn/Winter pieces that have made their way into Churchill Square's stores have really impressed me. I'm glad I picked out some transitional pieces that can easily be layered to suit our temperamental climate. Having said that, I can't wait for the weather to turn a little cooler so I can be snuggled up that leopard jumper! 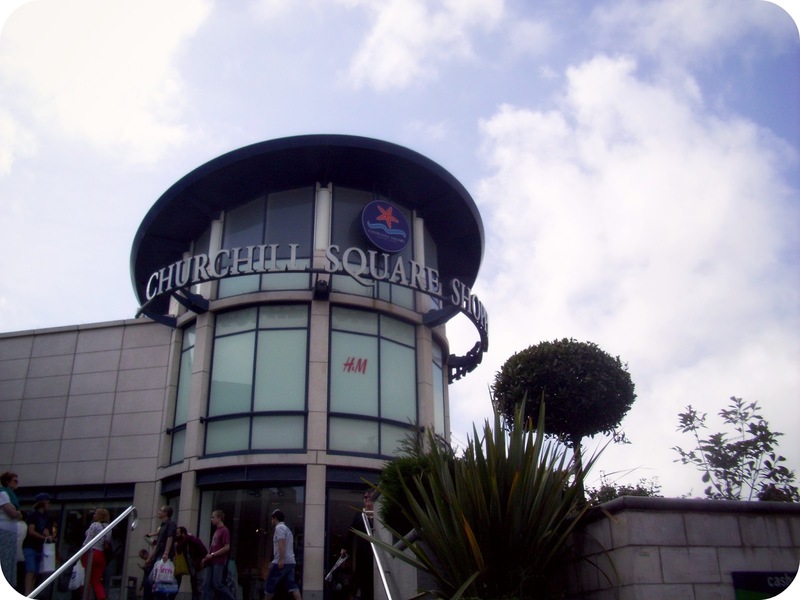 You can find out more about Churchill Square at www.churchillsquare.com. Those black lace-y jeans/trousers are gorgeous! I love pretty much everything A/W at the moment, especially the animal motifs, but my favourite has to be the 90s grunge, gothic and punk-y stuff going around a lot of high street shops recently. i like the jeggings with the top and the top with the beads details! Looks hot, love all tha lace. 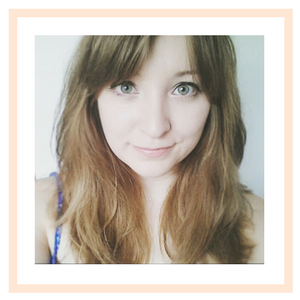 Just found your blog and I am loving your style!! I am really looking forward to all the metallics this season!